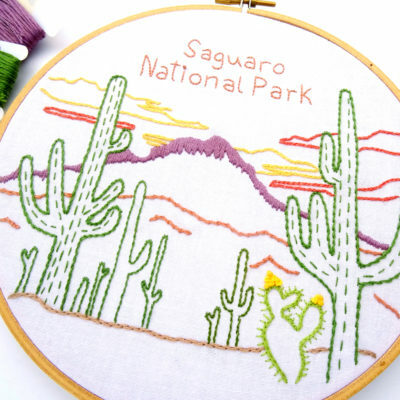 The United States boasts an astonishing number of sand dunes. 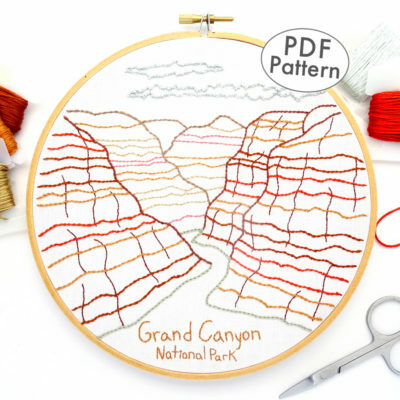 From lakeside dunes in Michigan to the famous White Sands in New Mexico, you can see (and play in) these massive mounds of ever-shifting wind-sculpted peaks and valleys all over the country. 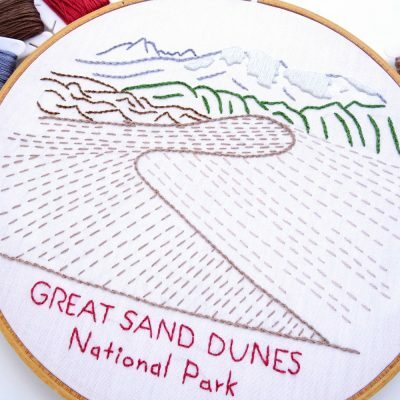 Perhaps the most unique sand dunes lie in the middle of southern Colorado. 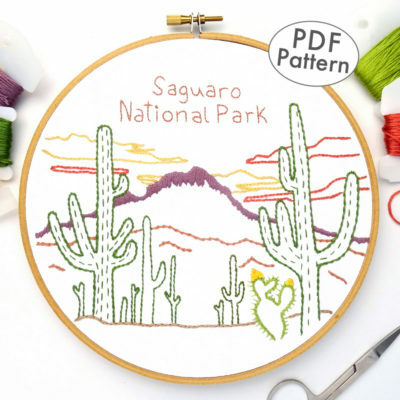 Amid a mountain landscape filled with snow-capped peaks, dense forests, and alpine lakes, is a vast area of sand that has collected in a valley of the Sangre De Cristo Mountains. 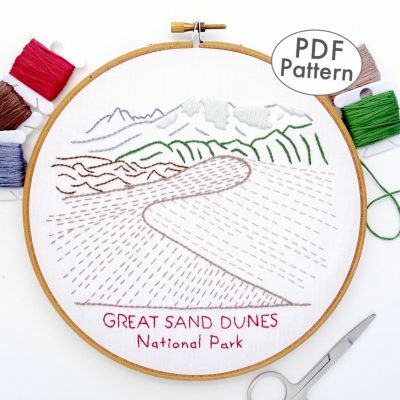 The Great Sand Dunes National Park pattern captures both the beauty and steepness of the dunes (the tallest ones in North America) along with the stunning surrounding landscape. 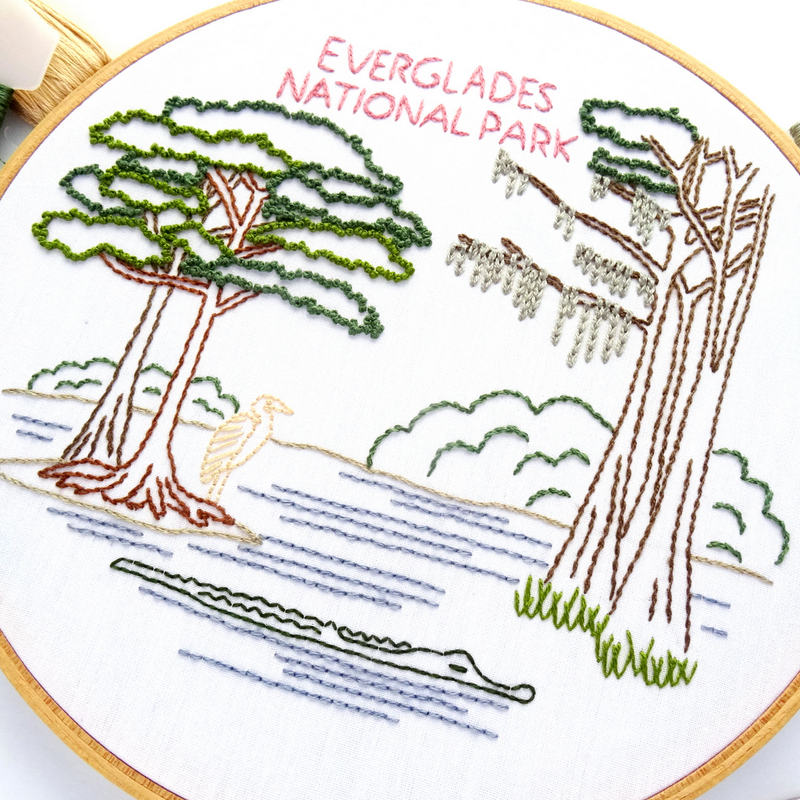 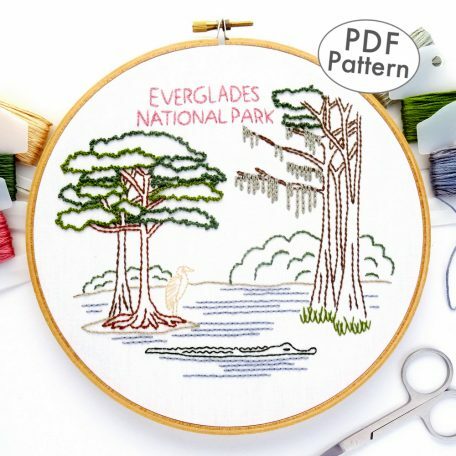 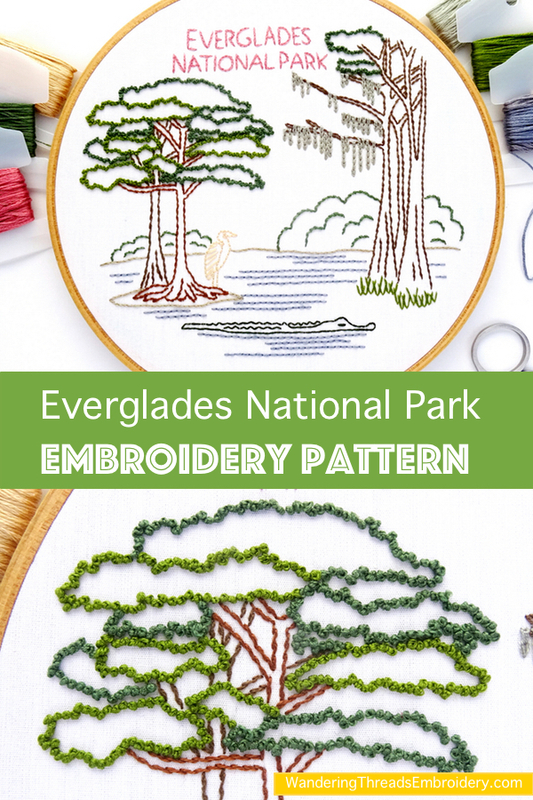 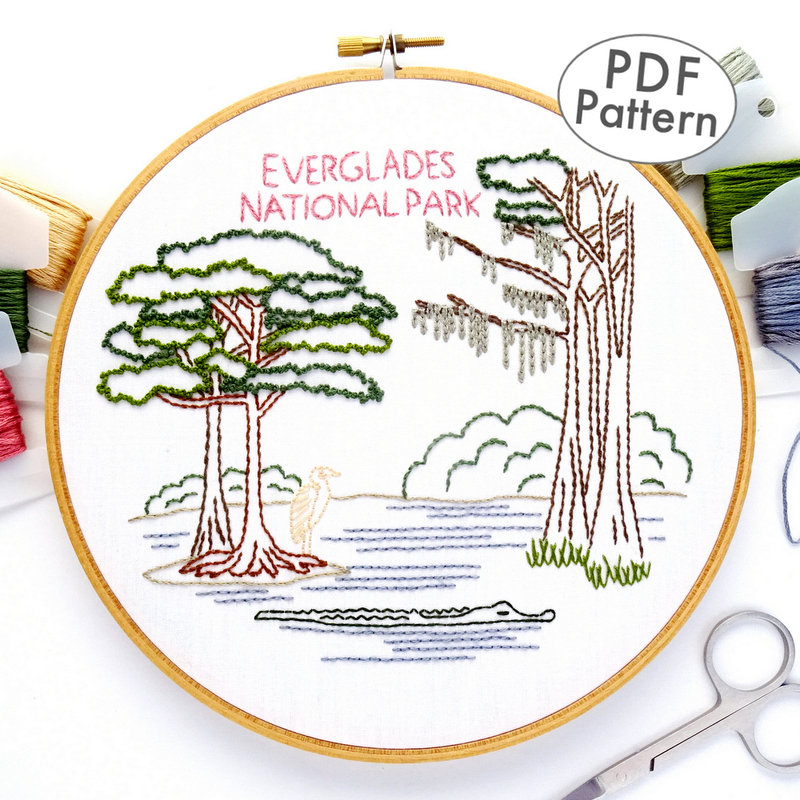 Designed with simplicity in mind, this pattern utilizes only a handful of basic embroidery stitches is suitable for both novice and expert embroiderers. 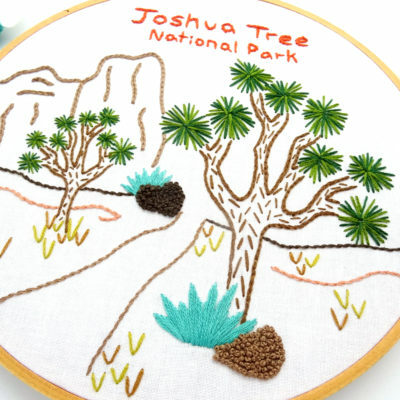 The vast, protected area of Joshua Tree National Park features jumbled boulders, wide open desert, and clusters of the magnificent twisted, spiky trees for which the park gets its name. 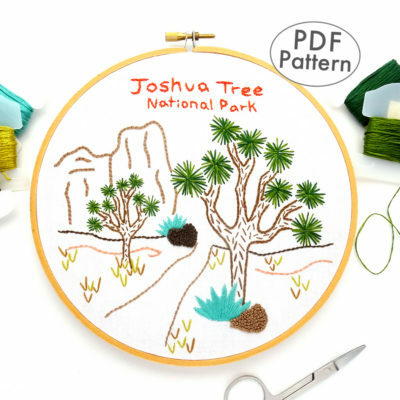 This hand embroidery pattern captures the unique and fascinating landscape with two Joshua Trees set amid a smattering of rocks and various desert plant life. 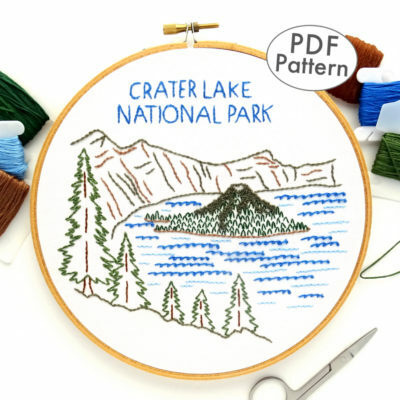 Famous for its sparkling, dark blue water, Crater Lake is one of the deepest lakes in the world. 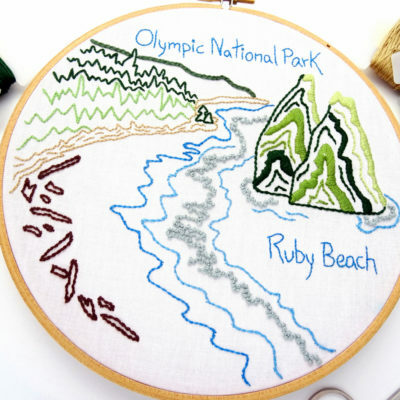 The lake was formed long ago when an ancient volcano collapsed, leaving behind a massive crater in southern Oregon. 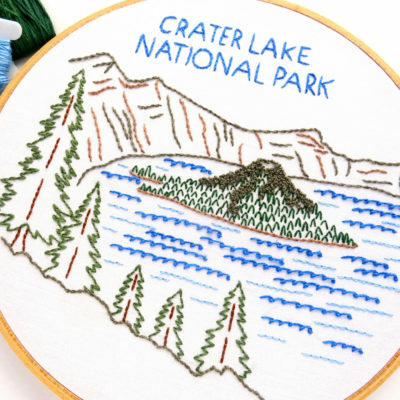 Established as a national park in 1902, Crater Lake is visited by thousands of tourists every year who come to peer over the edge of the rim at the mesmerizing water below. 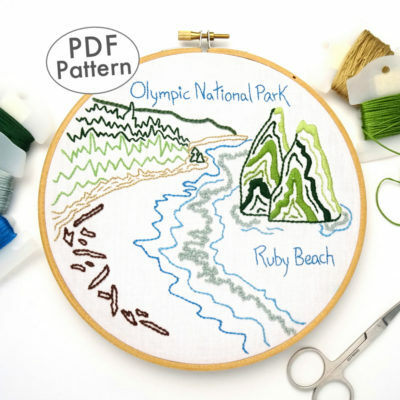 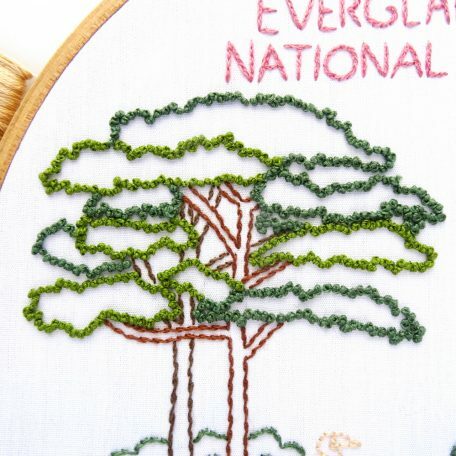 This one-of-a-kind embroidery pattern pays homage to the beauty of Crater Lake with a depiction of the view from the rim looking out at Wizard Island. 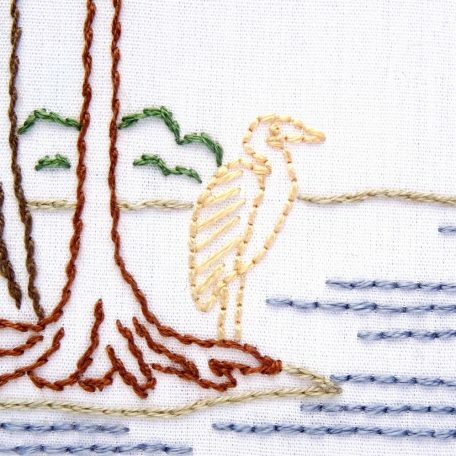 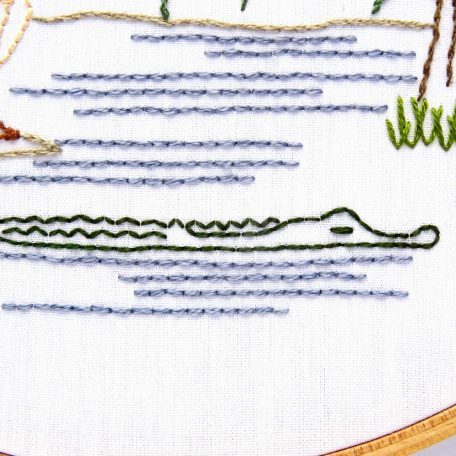 This is a beginner to intermediate level pattern that requires knowledge of basic embroidery stitches. 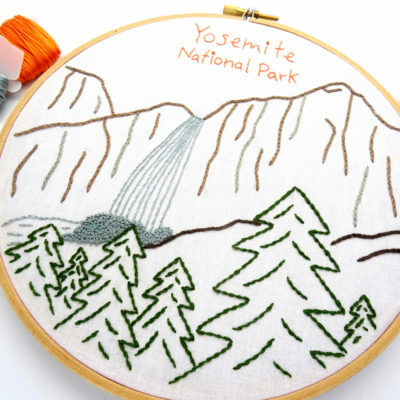 Capture the beauty and grandeur of Yosemite National Park. 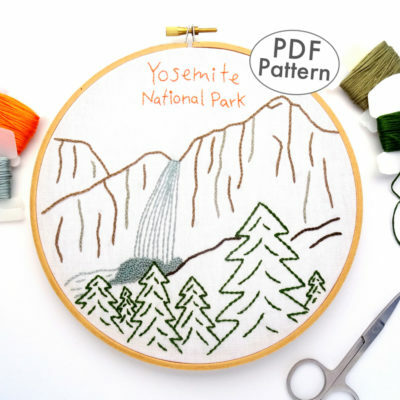 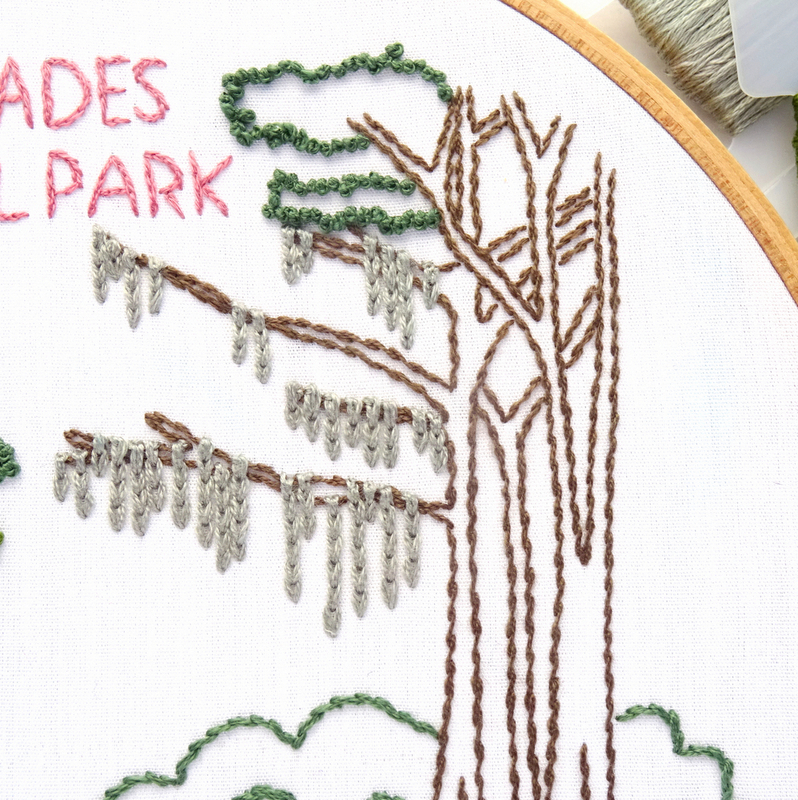 Featuring an iconic view of Bridalveil Falls, this pattern displays the cliffs, trees and cascading water that make the park a truly special place. 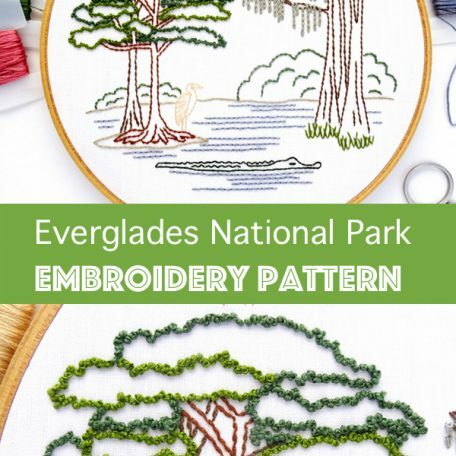 This simple pattern is perfect for novice and experts alike. 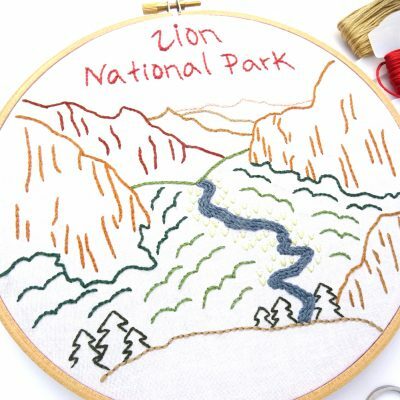 My favorite memory of Zion National Park is hiking to the top of Observation Point. 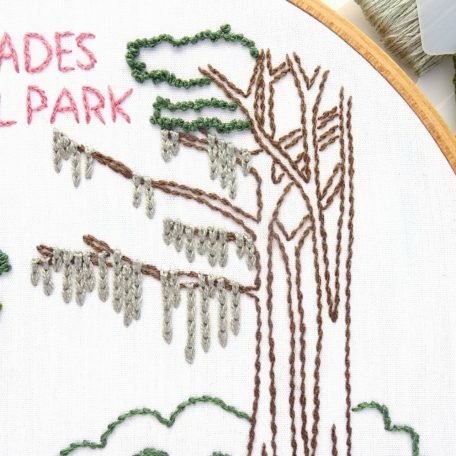 Not because I enjoyed the steep switchbacks or the narrow pathways that seemingly hang off the side of a cliff, but because when you finally reach the top and peer down over the edge, all the sweat and aching muscles are forgotten. 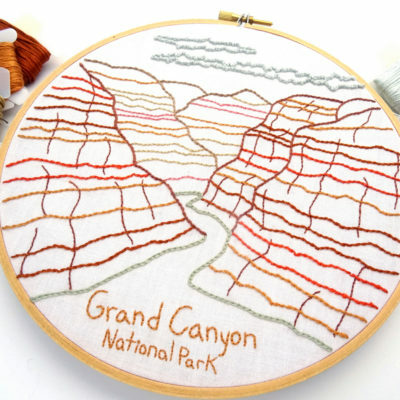 Laid out in front of you is Zion Canyon with the Virgin River snaking down the middle, shades of green climbing up the sides, and steep red cliffs towering on either side. 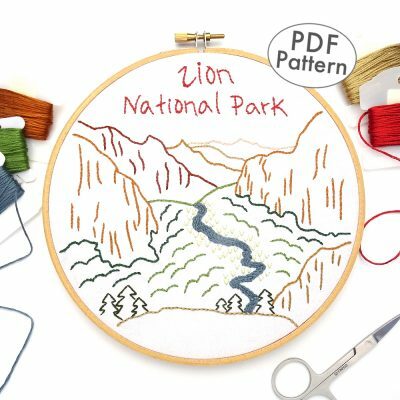 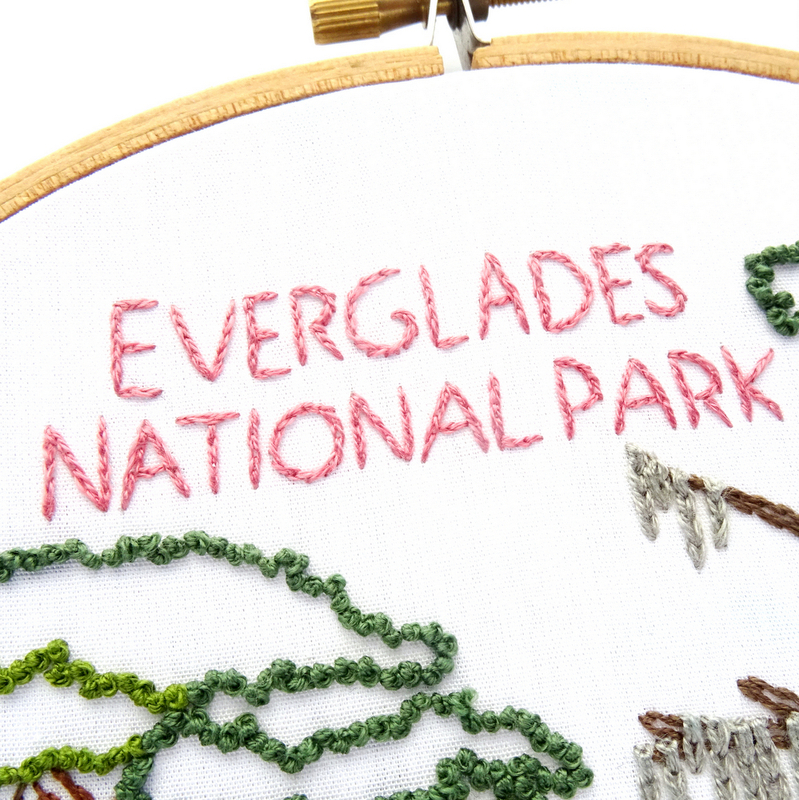 Lucky for you, I’ve re-created the view in this custom embroidery pattern so you don’t have to make the climb!